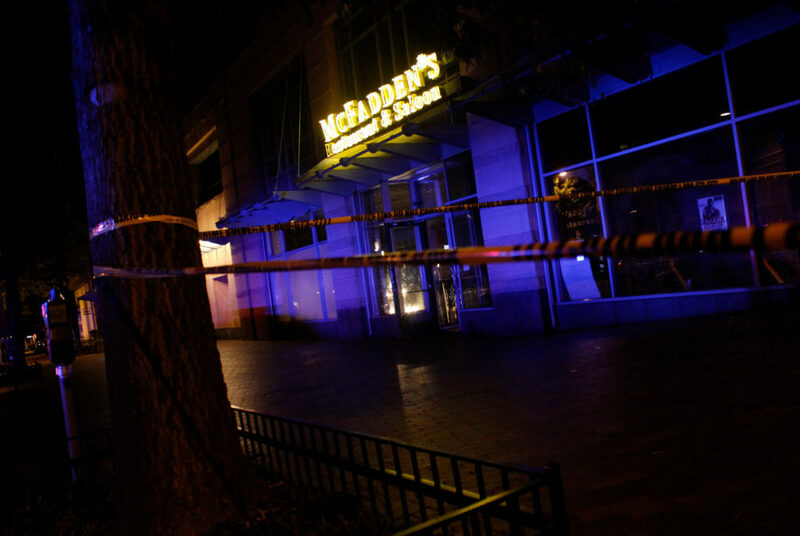 McFadden’s Restaurant & Saloon, which was located steps from campus at 2401 Pennsylvania Ave. NW, was a steady spot for students, but it shut down in 2015. Graduates returning for alumni weekend may notice a few of their Foggy Bottom favorites have been replaced. From upgrades to alterations, changes have spread across academic departments, buildings and bars. Take a step back to look at what the old GW looked like and then fast forward to the present in preparation for your return to Foggy Bottom. McFadden’s Restaurant & Saloon, which was located steps from campus at 2401 Pennsylvania Ave. NW, was a steady spot for students since it opened in March 2003. The bar, which clinched the No. 1 spot on Complex’s top 25 douchiest bars in D.C. in 2012, was a surefire spot to run into ghosts of fraternity parties past on Tuesday nights. That was until the bar was shut down after five patrons were stabbed there in December 2015. When McFadden’s closed in 2015, students flocked to Sign of the Whale at 1825 M St. NW on Tuesday nights. The phrase “say my name at Sign” echoes through campus as students often win happy hours in their name at the bar and their friends can get a wristband for half-off drinks if they claim to be a happy hour recipient. Upon arrival, most go straight to the bar and grab a Whale Pail, a mysterious concoction served in a small plastic bucket full of more types of liquor than hours of sleep that most students get. Before 2121 H St. was dubbed District House in March 2014, it was a conglomeration of three separate buildings – Crawford Hall, The West End and Schenley Hall. All three were built in the 1920s and were demolished in May 2013 to be combined into one building. Crawford Hall housed freshmen in mostly traditional double rooms. Known as the party dorm for sophomores, Schenley Hall featured eight floors and a basement full of partying. The West End also housed sophomores, but it appeared to have eight tamer floors. Alumni searching for their college home in the three former residence halls will find that the buildings were merged during a part of GW’s 20-year campus development plan into District House. About 850 students now live in either affinity-style housing or traditional doubles. The Superdorm added 300 beds to the Foggy Bottom Campus and a basement with a study space and six dining vendors – Sol Mexican Grill, Wiseguy Pizza, Chick-Fil-A, Beef N Bread, GRK Fresh Greek and Peet’s Coffee. For most alumni returning to campus, an entire school has been added since they were last students. The Corcoran Gallery of Art was founded by William Wilson Corcoran in 1869, and the gallery in the Flagg Building at 500 17th St. NW was turned into the Corcoran College of Arts and Design almost 30 years later. The art school was an independent university just a few blocks from campus until 2014, when the college and gallery and were absorbed into GW. Since the University acquired the Corcoran School of Arts and Design, GW has said they want to complete renovations to revive the 120-year-old Flagg Building. Construction began this summer, but $32.5 million is still needed for renovations. Alumni who graduated with art degrees may also find their major programs no longer exist in CCAS. In August, five programs in CCAS – including the departments of art history, interior architecture, music, theatre and dance, studio arts and museum studies and design – joined the Corcoran School. Alumni who attended the University in the 20th century knew the Mount Vernon Campus area as The Mount Vernon Seminary and College, a private women’s high school and college in the same location at 2100 Foxhall Rd. NW. Elizabeth J. Somers founded this educational institution in 1868 and played a huge role in advocacy for women’s education. After 121 years as its own institution, the Mount Vernon College was picked up by GW as a satellite campus in 1997. It didn’t officially become a part of the University until two years later, though. The two campuses are now “fully integrated,” the punchline to many jokes, with a shuttle between the two called the Vern Express. The ride is so bumpy that people tend to hit FitBit step goals because of the constant bouncing on the shuttle, which students call The Vex. All jokes aside, the campus hosts sports teams’ practices and games and is a prime getaway from the concrete jungle to the actual forested woods. Alumni who never experienced a University with a second campus 15 minutes away should take the trip out to see what has become such a big part of life at their alma mater.